June through Sept 7th – Swimming @ Palestine Public Pool – See detailed pool info, hours & pass pickup detail here. 4th of July fireworks presented by the City of Palestine will be taking place at Steven Bennett Park (5500 N. Loop 256). Concessions begin at 5 p.m., and the fireworks start 30 mins after sunset. (Sunset at 8:40pm). Tune into KYYK 98.3 for corresponding music to the fireworks to make the experience even more memorable! Local law enforcement will close Loop 256 between Park Avenue (Hwy 84E) and Palestine Avenue (Hwy 79E) to all traffic, this would include all cross streets such as Lacy, Murchison, Moody, Beverly and Caplain, beginning at approximately 8:30 p.m.
July 4, 2015 –Classic Movies in Reagan Park – Classic Cinema is spotlighted the first Saturday of each month. Bring your blankets and lawn chairs to Reagan Park and enjoy classic movies under the stars. Admission is free to the public. Popcorn and sodas are available for purchase. For more information, call 903-723-3014. July 4th-The Texas Hobo Cook-Off and Gypsy Jamboree at the Texas State Railroad, 6pm.Categories: chicken, pork spareribs, brisket. prizes awarded at 5pm. R&R on the Rails (train ride to Maydelle and back). Live Concert & Fireworks Show. $20 for adults and $10 for kids. Book Tickets. June 20-26th: Christmas in July – Holiday sales & fun, holiday shopping in the downtown Main Street district. 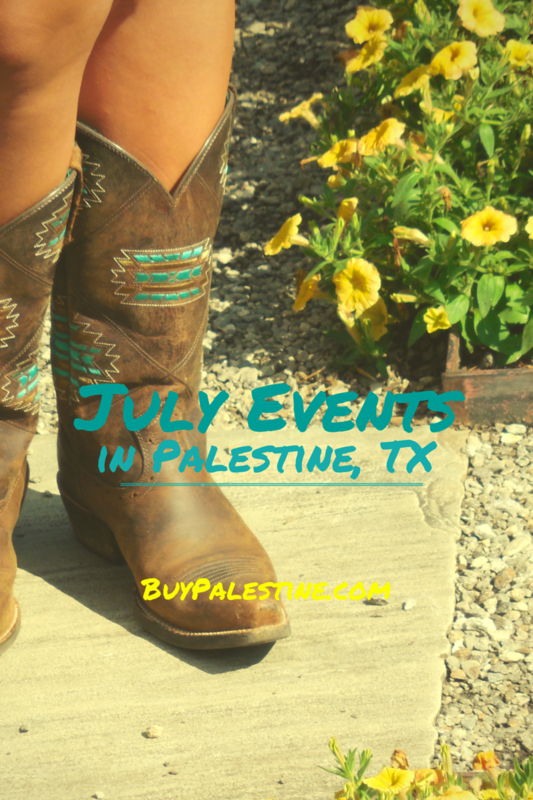 Click the link to view–a bunch of awesome events! July 23, 24, 25 & 26 – The Historic Texas Theatre Presents: MARY POPPINS, THE MUSICAL at The Texas Theatre. Click here for Ticket Info. July 25th – Cars of Palestine Holiday Cruise Night- Food, Fun & Music at the Palestine Farmer’s Market from 6-10pm. Lisa E. Priest loves a good backyard BBQ and is a Palestine, Texas REALTOR® / Real Estate Agent with Picket Fence Realty, Inc. You can reach her via phone or text at 903-948-3343 or read more at BuyPalestine.com.